If you enjoy eating healthy foods, whether you live a vegetarian lifestyle or not, it helps to expand your fruit and vegetable intake by trying foods that aren't grown in your area. Which Asian Fruits Will You Be Stocking Up On? While you used to have to shop at an Asian market to get most of the fruits in this list, now many of them can be found at your usual grocery store. Here are some great Asian fruits that are worth adding to your diet. Included with a description of each are some of the health benefits you'll get by adding these to your grocery list. Asian Pears look more like apples than pears, but their nutritional value resembles that of other pear varieties. Asian Pears have a lightly sweet taste and a crispy texture. They are used in stir-fry, not just eaten fresh. They are low in calories and have a high fiber content. They also contain micronutrients that are good for heart health. 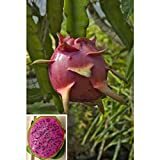 Dragon fruit kind of looks like a dragon egg on the outside. The inside is even weirder, with a white coloring and black seeds. Its consistency resembles that of a Kiwi fruit. This mild flavored fruit doesn't taste like Kiwi. Rich in antioxidants and even vitamin C, this bland fruit also contains healthy fatty acids and proteins. DELICIOUS AND UNIQUE - jackfruit is deliciously sweet. It has a hint of peach and pear and tastes similar to mango. While jackfruit is used as a meat replacement, because its texture resembles that of pulled pork, it doesn't have a lot of a flavor. It doesn't taste like meat, but it doesn't taste like fruit either. This strange fruit is high in fiber, as well as vitamins A and C.
This citrus fruit may come in a tiny “package,” but it packs a punch when it comes to flavor and vitamin C. Kumquat, unlike most citrus, can easily be eaten whole (without peeling). They have a little bit of a bitter flavor this way, but they do make an excellent marmalade. 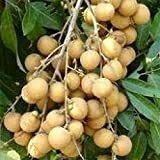 The longan fruit is one of the most delicious fruit in the world. You should sow it in the bag about3 months. Then gradually move down in the soil. Longan berries aren't much to look at, but they are heart healthy and help with skin health. They have a kind of gross nickname, Dragon's Eye Meat. When you open the brown exterior of the berry, you find a whitish gel-like compartment, which is the juicy pulp you'll eat around a dark colored seed inside. Lychee is similar in appearance to the Longan fruit, especially when cut open. The outside is a reddish color. Lychee has a sweet flavor that is packed with potassium and vitamin C.
Rich in natural antibiotics and anti-inflammatory properties, the Persimmon is a low calorie and low-fat fruit. It is rich in antioxidants and phytonutrients, among other things. They have skin healing properties that are used in natural skin care products. They taste like honey, very sweet. Mangosteen is a weird looking little fruit. Its rind is not edible, but the white fleshy bits inside are. They are fibrous like the rind of the citrus fruit and have a tangy, yet sweet, flavor. They are high in vitamin C and also contain some calcium, as well as iron and magnesium. While this fruit somewhat resembles the jackfruit on the outside, they have one big difference on the inside. Durian is known for being a smelly fruit. Its smell has been compared to that of rotting meat. To tell the difference between this smelly fruit that is rich in many nutrients (including riboflavin, B6, zinc, calcium, magnesium, iron and more) and the jackfruit, look at the shells. Jackfruit shell is pebbly, and durian has a spiky shell. Smell aside; it has a sweet flavor. Rambutan is a berry-like fruit much like the Lychee and Longan fruits. This red-shelled fruit has a weird spiky exterior with white insides like the other two fruits. It has anti-parasitic properties and tastes sweet, with a creamy texture. This grapefruit-like fruit is colorful and extremely rich in vitamin C. It's found not only in southern Asia but also in Hawaii and Indonesia. This strange member of Asian fruits looks a bit like a small white or red pear. They are sometimes called rose pears because they have a rose-like flavor. This fruit is rich in vitamin A, calcium, and also contains sulfur. Star fruit's name comes from the fact that it looks like a star when you slice pieces off. Also known as Carambola, this fruit is rich in antioxidants and vitamin C, and is a citrus fruit. These Asian fruits have been described as having a flavor that combines citrus with grapes, apple, and pear. Each of these Asian fruits will make a healthy and tasty addition to your diet. They are rich in vitamins and nutrients that will help you get a well-rounded, healthy diet.